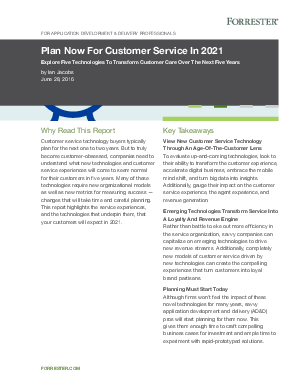 Customer service technology buyers typically plan for the next one to two years. But to truly become customer-obsessed, companies need to understand what new technologies and customer service experiences will seem normal for their customers in five years. By 2021, the internet of things (IoT) will have transformed many companies from being products-based to services-based. Rather than wait for the future to arrive, you need to start planning for tomorrow’s technology today.